The last subsection brings us to wilder speculations that we have stayed away from throughout our discourse. In the SUSY conference, the context from which this book originally arose, ideas range widely, if not wildly. There are now a wide range of ideas regarding how electroweak symmetry breaking and its protection could occur in Nature. Some of these frameworks could touch upon flavor. To this author, from an experimental point of view, however, the question is identifying the smoking gun, or else it is better to stick to the simplest (rather than elaborate) explanation of an effect that requires New Physics. That has been our guiding principle. 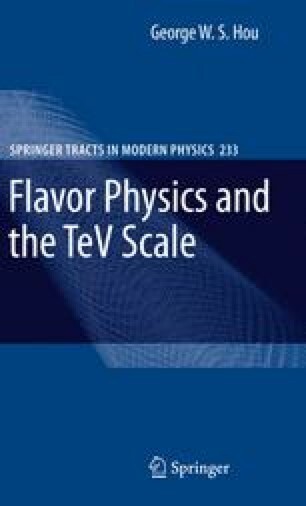 Most of the new(er) ideas related to EWSB are best tested by direct search at the LHC, rather than in flavor physics, since the problem of electroweak symmetry breaking and the problem of flavor are largely orthogonal issues.